The Los Angeles Memorial Coliseum is proud to recognize February as “Black History Month” and celebrate the achievements of African Americans and their role in both our history, as well as the history of the United States. For nearly 95 years, our stadium has hosted thousands of events before more than 118 million visitors which featured some of the most recognizable African American athletes, performers and dignitaries who not only define universal human aspiration, but whose accomplishments continue to inspire generations; including among others, Jesse Owens, Jackie Robinson, Kenny Washington, Carl Lewis, Martin Luther King, Jr. and Nelson Mandela. 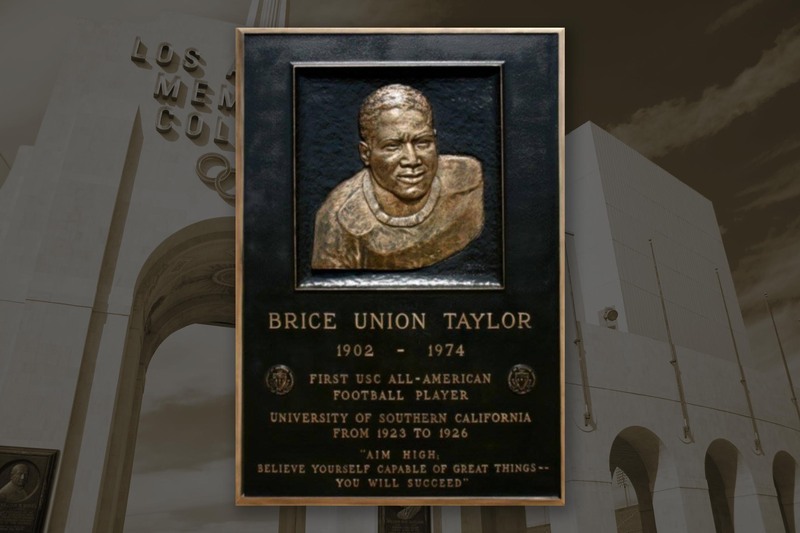 Today, the Coliseum is proud to celebrate the legacy of Brice Union Taylor, an athlete who broke racial barriers for African American football players. Born on July 4, 1902 in Seattle, Taylor was a descendant of African slaves and Native American tribe leaders. Tragically, he was orphaned at the age of 5 and grew up in a foster home. As a teenager, Taylor discovered his athletic skills and was accepted onto his high school football team. Although he was born without a left hand, Taylor was phenomenally talented, and was offered scholarships from more than two dozen universities when he graduated. In 1923, Taylor accepted an offer from the head football coach at the University of Southern California, “Gloomy” Gus Henderson. Taylor was a Trojan from 1923-1926, and in 1925, he became USC’s first All-American football player. After graduating, Taylor was hired by Southern University in Louisiana as the Head Coach and Athletic Director, a tremendous accomplishment at that time, particularly in the southern parts of the United States. In 1931, Taylor led Southern to its first undefeated season in his final season. After leaving Southern University, Taylor returned to California, becoming the first African American high school head football coach at Jefferson High School in Los Angeles. In addition to coaching and teaching, Taylor also received a doctorate in theology, serving over 40 years as a minister in the First African Methodist Episcopal Church. For his profound impact and contributions towards not only our history but in breaking unjust racial barriers that paved the way for African American athletes in this country, Brice Union Taylor’s plaque resides within our Memorial Court of Honor. Previous Vote for Lobsterdamus Lobster Nachos at the Coliseum!